The best songs don't just tell a story set to music ? they capture a moment, encapsulate a feeling and draw in the listener, in a way that's at once singularly personal and completely universal. When Toronto singer-songwriter Jason Collett was mulling over titles for his new album, the by-turns effervescent and elegiac Here's To Being Here, he stumbled across a line in an anthology of poetry by his friend Emily Haines' (Metric) late father Paul, a well-known avant-garde jazz poet. ?I really love the simple sentiment of the title. I think of it as a toast, a raising of the glass to the notion of being present to the moment. Recording this record was all about that for me. Capturing the bits of spontaneous magic in the studio that are just the happy accidents of the day. For me there's a kind of unadorned celebratory ring to the phrase ?here's to being here'. There's no irony in it, and lord knows we've all had enough of that for a while. I really like Haines' playful writing. It's like Dylan, almost Dada-esque; it doesn't take itself too seriously. I really relate to that era of writing? Ginsberg, that pre-'60s movement.? Fittingly, Collett's own work draws upon such classic cultural touchstones while continuing to push the boundaries of the great singer-songwriter tradition. After over a decade of honing his sound and style, in the process becoming a key figure in Toronto's burgeoning indie scene, Collett returns with the long-awaited follow-up to 2005's critically acclaimed Idols of Exile. But where Exile was one big house party featuring Collett's Broken Social Scene brethren, the guestlist was scaled back a bit for Here's To Being Here, which was built largely around Collett's former touring band Paso Mino, with producer Howie Beck, New York guitar great Tony Scherr, The Stills' Liam O'Neil, BSS' Kevin Drew, and members of Apostle of Hustle and the 6ixty8ights all lending a hand in the studio. When it came time to get off the road and begin to record some of the 40-plus tunes the prolific Collett had written over the past several years (the father of three children, the busy musician notes he's able to find sanctuary and perspective to write while on tour), the recording process took place in two quick but productive sessions in winter 2007: four days in a barn an hour outside of Toronto with engineer Marty Kinack in February, and two days at Toronto's Hallamusic studio in March. ?For me, the studio is a very different beast from playing live. What you're trying to do is capture a bit of magic in an environment that doesn't necessarily lend itself to that. Howie and I have a really dynamic thing going on,? Collett says of working with Beck, who also produced his last album. ?He's the Woody Allen of rock and roll: he's neurotic, funny, he's got crazy ears ? he can hear things that other people can't, which drives *ME* crazy. He works fast, and I like working fast.? Here's To Being Here is the sound of a seasoned songsmith fully coming into his own signature sound ? from the '70s AM-radio vibe of road-tested favourites like the rollicking relationship reflections ?Not Over You? and ?Out of Time? to sparse countrified ballads like Canadiana ode ?No Redemption Song? and album closer "Waiting For the World" (partially inspired by Collett's friend James Loney, who was taken hostage in Iraq in 2005), the album redefines the contemporary guitar-based singer-songwriter framework for the current genre-blurring musical landscape. As tuneful as they are poetic, these masterful songs of hope in an age of disillusionment stick in your head as firmly as they capture your heart. ?I feel this is a rock-and-roll music record. Not rock, not rock and roll, but Rock 'n Roll music. I don't care much for the roots-rock tag or the singer-songwriter one and all the banality those genres conjure up. Rock 'n Roll music encompasses all sorts of influences ? country, blues, gospel... all those things, and I'm just part of that tradition,? Collett points out. ?We decided midway through the record to avoid embellishing it with horns and strings ? which I really love, but I think it sort of helps make the record more cohesive with the absence of that indulgence. There's not a lot of trickery to it. It's not like we really stripped things down, it's just that we never gussied them up.? 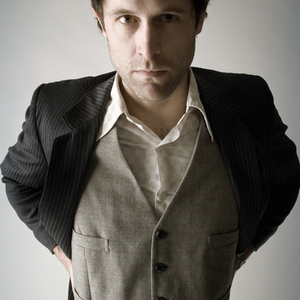 Collett, who began writing to try to escape the boredom of the suburb of Bramalea where he grew up, and logged time in Toronto bands before going on to craft two full-length albums (1999's Chrome Reflections and 2001's Bitter Beauty) prior to joining the Arts & Crafts family in 2003, has always penned songs with a poet's knack for reflection and a journalist's eye for detail. That timeless quality permeates Here's To Being Here, which not only allows listeners a peek into the songwriter's thoughts, but also a glimpse into the everyday human emotions that bind us. ?I'm beginning to recognize that I have a body of work. I've always tried to make records with a classic sensibility, so that they're records you can listen to 20 years from now,? Collett says. ?I feel like I connect when I'm just being candid. I want to take the audience on a journey with me ? by being as present in the moment as I can.? With the release of Here's to Being Here, Collett looks back at the ghosts of his past while keeping his eyes firmly fixed on the future. The title says it all: it's a line of poetry, an affirmation, a toast to where we've come from, and where we're going.